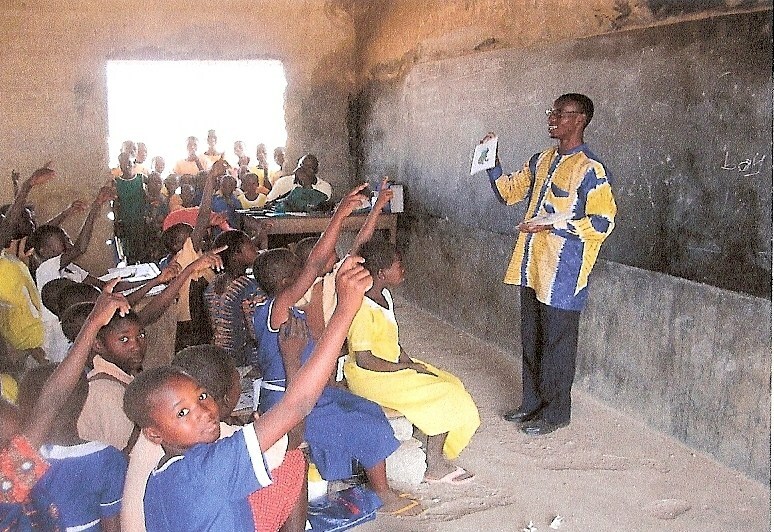 “Let’s Read” was started and continues to be run by four experienced UK primary teachers – all of whom first went to northern Ghana as Millenium Volunteer Global Teachers in 2001, with Link Community Development. Responding to the direct requests of Ghanaian Headteachers, we devised a comprehensive reading support scheme for primary schools in Bolgatanga and the surrounding area. The aim of the scheme is to make teaching and learning more effective by encouraging interactive strategies, and through the use of phonics. There are four elements to the scheme: (1) in-service teacher training; (2) Leadership and Management training for Headteachers; (3) the provision of classroom materials; (4) on-going support from a dedicated, Bolga-based VSO volunteer. The materials consist of sets of laminated coloured cards, in A3 and A4, using mainly local photographs and age-appropriate text material, together with sets of letter and word cards. We have worked with over 40 schools in Upper East Region, some of them extremely isolated. Now partnered by Afrikids, an active Child Rights organisation based in Bolgatanga, our current focus is to continue to develop the scheme, whilst also seeking sustainability. Between two and four of the team visit N. Ghana twice a year. The costs of travel and accommodation are paid by the volunteers, all other costs are met by fund-raising efforts. (It costs about £400 per school to provide the cards for each class.) 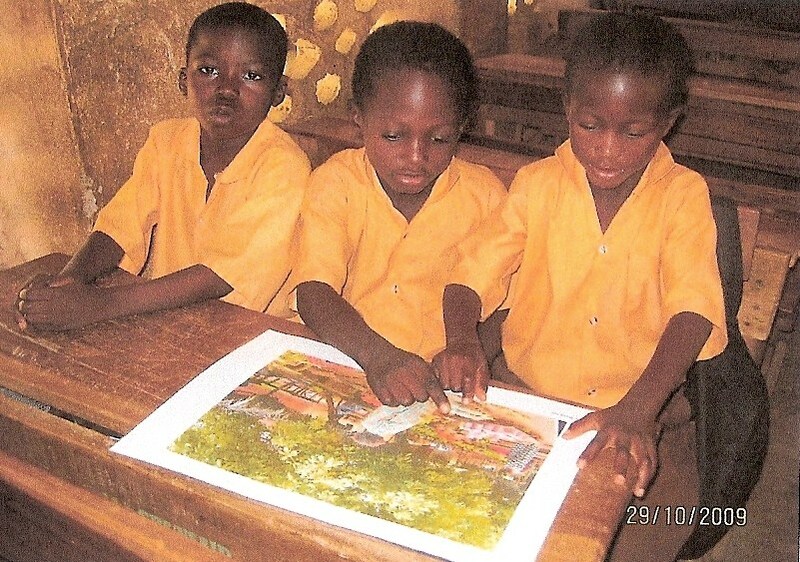 Ghana School Aid has been happy to support this scheme on several occasions. The pictures show the cards in use. In partnership with Afrikids, this charity is working with schools in the Upper East Region, training teachers to improve the teaching and learning of English. Thirty second-hand computers have been donated and loaded with simple literacy and numeracy programmes. The driver/technician takes them to the 11 participating schools in turn, introducing pupils to the digital world. £4000 was donated via GSA from two Quaker supporters in the West Midlands, specifically to pay the driver/technician for the 2-year pilot period. The Harmattan is a dry and dusty wind that blows south from the Sahara at this time of year – so that’s how it is in N. Ghana right now – hazy, dusty, hot, very dry and windy! I don’t know how the animals manage to find anything to eat – and it’s very tough for people too! Well, it’s nearly two years since I managed to get to visit the Let’s Read schools – and quite a lot has happened since then! We now have 30 schools in the project (3 groups of 10) – and have set up a “Laptop Library”. The schools in Let’s Read 1 (LR1) – in Sirigu – are now well-established with phonic teaching and a more child-centred approach; LR2 schools are now in their second year – and LR3 are just beginning. We were delighted to find good pupil progress (in using phonics) in most of the LR2 schools – and some enthusiastic teachers and Headteachers in LR3 too. The LR3 schools seem less well-equipped and more remote. Two of them are called “island schools” because they get cut off by rivers in the wet season. The Headteacher of one told us that they have to get all the work done in the dry season because neither teachers nor pupils can get there when it is raining! There are many classes held outside – “under the tree” – which is not too bad in the best cases (with desks and a proper board) but can be a real challenge. In one school, there were about 30 P1 children squeezed on to a couple of mats – inevitably pushing each other – and the teacher had an old piece of plywood for a blackboard When the wind blew, the children shut their eyes against the sand, and the board fell over. Not ideal learning conditions! We have a van for the Laptop Library and employ Bala as the laptop manager. He takes our 30 second-hand Netbooks round to three schools a day (10 computers each). The children whoop with joy when they see the Laptop van arriving –and they call him “Mr Laptop”, which he loves! Most schools choose an older class to do IT – and the pupils have made remarkable progress. There is no electricity in any of the schools – so the laptops go back to be charged at the AfriKids centre each night. It seems to be a very effective way to give the children hands-on experience in IT; this is a compulsory, examinable subject at the end of P6. On the last morning, I visited Mother of Mercy School, whose Headteacher, Lucy, visited in Coventry in 2014. I went into a few classes; then she told me that the PTA were coming to greet me. Indeed two members of the community came – and expressed their thanks for all that Let’s Read has done for their school. It was lovely to meet them. As a mark of gratitude, I was presented with a live guinea fowl – a very handsome specimen! Slightly awkward for a vegetarian…. Lucy kindly held it for me – and we later came to an agreement with her that she could have the guinea fowl soup and we would keep the photos! The remarkable thing about Let’s Read – the factor that keeps us going back – is the enthusiasm and commitment of the teachers, working in the most difficult circumstances, willing to listen to new ideas – and always welcoming! This entry was posted in Projects and tagged lets-read by Penny Sewell. Bookmark the permalink.